When Millie broke up with Hugo on the banks of the Thames in the second episode of season two (next time I have to have a difficult conversation I am so arranging to meet in that spot – full camera crew optional) she was wearing a plunging black lace blouse that got y’all pretty excited. It’s a bit low-cut for my liking, but then I don’t have enough of a cleavage to want to go around showing it off. If my bosoms were slightly more boobalicious, I’m sure I would. But I digress. The blouse in question is from uber-hip brand The Kooples. I’m absolutely intruigued by The Kooples – like, are those couples real?? Surely no one is that cool. And all the boys have the most incredible beards… You know how I feel about beards – and if you don’t, be assured that I like them. Longtime. 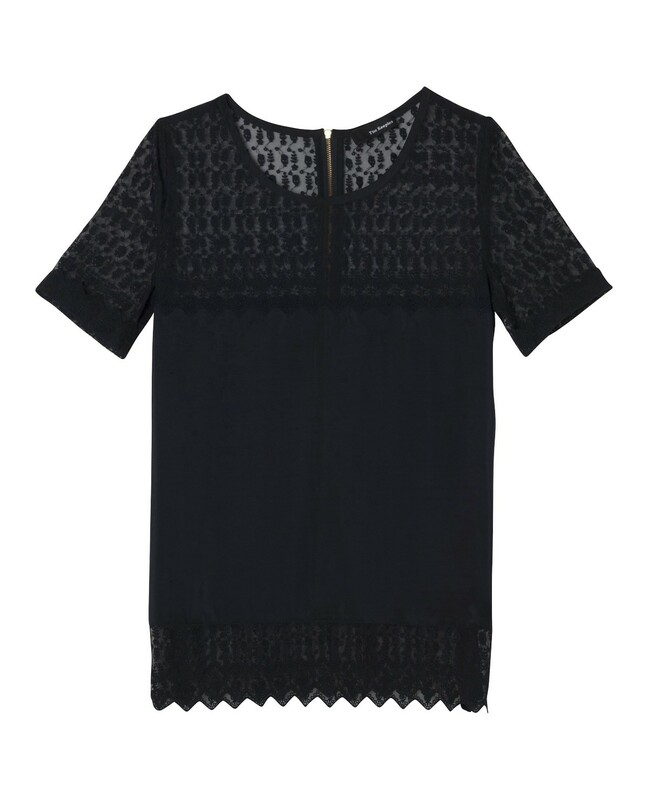 Millie’s blouse is no longer on the website, but I prefer this equally delish black lace top from The Kooples which is perfect for winter 2011 and a bit less knocker-tastic. The other Millie item I’ve been asked about is a real wardrobe staple for her – the faux fur gilet she has worn in several episodes. Hugo was bad….was I badder? 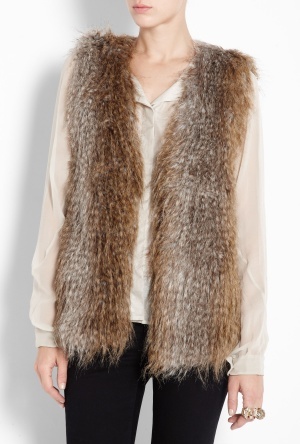 If you’re a fashion follower, you’ve probably already invested in your (faux) fur for the chilly months, but if you can’t get enough of it (I’m on four fake fur jackets and counting) a gilet does add a bit of Chelsea-esque glam, particularly to jeans and jersey tops – or to vintage/vintage-inspired printed dresses (as per my little eBay look). Product images from Wallis, mywardrobe.com and House of Fraser. There’s more colours on their boutique on ASOS market place! Olivia – loving the blue. Tres funky! Do you mean the red print dress she wore when she left the table and spoke to Proudlock on the balcony…?? OMG I LOVED that dress too. Deffo going to be investigating that. Hi there….do you know where Millie got her dress from – the one she was wearing at Bluebird on Monday nights episode? It was cream, with flourescent splashes of colour – I love it!! Can you help me find out where I can get the long fur scarf (Mink I suspect) she wore in the very first episode when she walked into Raffles the club and is in the bar eyeing up Fredik and Francis with Caggie. Also what would you call this? A scarf? wrap? cape? Am getting sooooo many requests now, would be great if y’all could send me pics of the outfits/items you are trying to find (screen grab is cool) to give me a head start – thanks! I have just stumbled across this site and you are like God! very good at what you do, did you say that caggie’s austique dress will be available in feb 11 gives me a chance to save, millie wore a cream maxi dress, when she was in Paris and she went to dinner with Caggie and someone else , can you tell me where its from please ? And yep, Austique should have that dress after Chrimbo. Am desperate to find the scarf Millie wore – have searched everywhere…long, silver – GORGEOUS. Pls help! BABS. 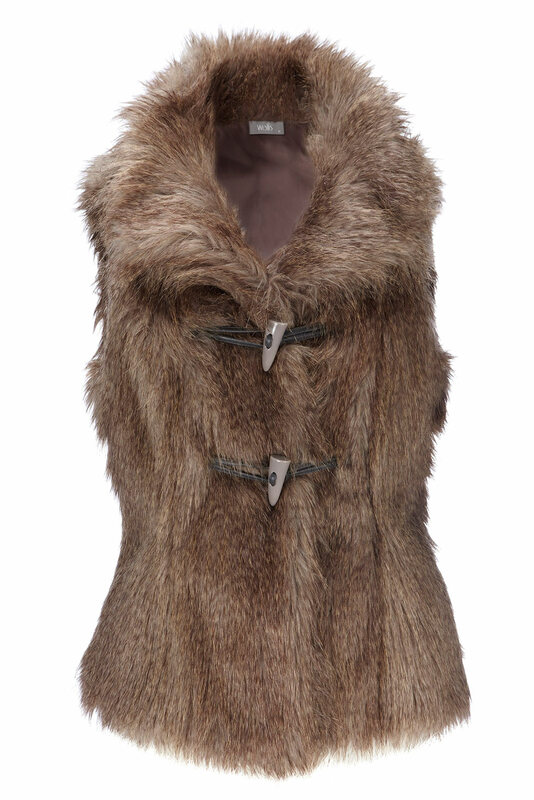 The long fur scarf she wears is real mink and is vintage – her granmother gave it to her. There are 2 of these lace tops on eBay at present. One in Black and one in Ivory.